It's hardly "serious" fiction, but the miniseries Shogun takes Japanese history more seriously than most recent Hollywood productions. One exception is Martin Scorsese's Silence. Scorsese stuck closely to Shusaku Endo's book and hired BYU professor Van C. Gessel as a consultant. Gessel discusses the experience in the lecture featured below (the audio quality is unfortunately poor). Shogun is also based on a novel. James Clavell did his homework too. But nobody sells 15 million copies of anything conducting a graduate course on medieval Japanese history and anthropology. So Clavell methodically runs through a checklist of every "educated" stereotype on the subject. And probably promulgated a few new ones. This isn't necessarily a bad thing. Stereotypes persist because of their utility. If 15 million people can be persuaded to read a 1152 page melodrama about Japan's Warring States period at the end of the 16th century, maybe they'll be game for more substantive fare. But how does the miniseries otherwise hold up as a cinematic experience? Sure, it clunks rather loudly at times. But all things considered, better than I expected it would. 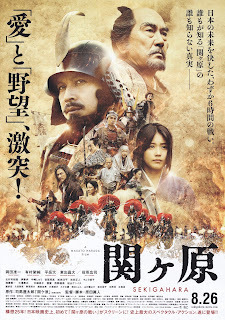 As mentioned previously, Shogun looks like a NHK historical drama from the early 1980s. That's a criticism and a compliment. And no surprise: it was shot at Hikone castle, Himeji castle, and at the legendary Toho, Shochiku, and Daiei-Kyoto Studios. It's nice to see real Japan in a movie about Japan. The Last Samurai was shot in New Zealand, 47 Ronin was shot in Scotland and Hungary, Silence was shot in Taiwan. This isn't all the fault of Hollywood. Local Japanese politicians haven't quite grasped the idea of a film commission that recruits big budget film productions and cuts through the red tape on their behalf. One advantage of building sets and shooting in places like New Zealand is not having to matte out the backgrounds. As Akira Kurosawa once noted, "Japan's penchant for power lines and retaining walls has left little unspoiled scenery for movie makers." Shogun director Jerry London employed the same cheats as Masato Harada did shooting his 2017 historial epic, Sekigahara: high and low angles with tight fields-of-view (which is less annoying when the castle in the background is a real Japanese castle). Shogun co-star Yoko Shimada wears too much makeup and the wigs aren't terribly convincing. Again, what you'd expect in a NHK drama from forty years ago. They've greatly improved in both departments since, though the chonmage (丁髷) is still a challenge. The chonmage hairstyle lasted well into the 19th century. It's essentially a reverse Mohawk, hard to pull off without leaving a bump across the forehead. Issei Takahashi in Naotora wears one about as good as I've seen—except when viewed from the back. But it's a costume drama, so—costumes. 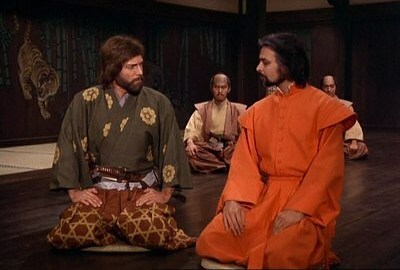 Richard Chamberlain wears a hakama quite nicely. 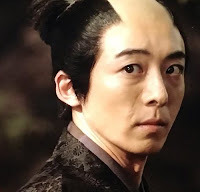 But knowing a little more history (and being exposed to a lot more Japanese television) than I did back then, what first upset my suspension of disbelief was the casting of Ishido. 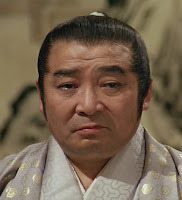 There's no arguing with Toshiro Mifune as Toranaga, nee Tokugawa Ieyasu, though sans the chonmage that in contemporaneous portraits Ieyasu is always depicted sporting. I suspect that Mifune, as well as Kaneko, simply didn't want to go through all the bother, the kind of thing an actor can get away with if he's a big enough star. But casting Nobuo Kaneko as Ishido only made me grin. The problem is that Nobuo Kaneko resembles a Japanese Edward G. Robinson. Maybe they wanted to be obvious and have a heavy play the heavy. Ishido's historical equivalent is Ishida Mitsunari, who led the Western armies against Ieyasu's Eastern forces. Mitsunari was only forty-one at the Battle of Sekigahara. He was a capable administrator who single-highhandedly kept the regime viable as Hideyoshi turned into a paranoid Shakespearean villain, executing anybody who challenged his legitimacy or threatened the succession of his son and only heir. Mitsunari made a lot of enemies as Hideyoshi's enforcer. He also lacked battlefield experience, not having fought in Hideyoshi's two pointless Korean campaigns. As a result, keeping his allies on the same page was like herding cats. Many simply disliked Ieyasu more than they disliked Mitsunari. Ieyasu as well usually left the fighting to others. A wily politician and negotiator, he convinced (bribed and coerced) several of Mitsunari's generals to either sit out the fight or defect to his side. The cataclysmic battle was over in a single day, despite half of Ieyasu's army arriving a day late. As one of history's great might-have-beens, Mitsunari has long been ensconced in the pantheon of Japan's heroic losers. 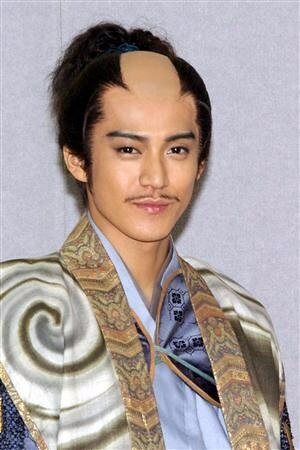 As such, he is invariably played by a dashing young actor, like Shun Oguri's portrayal of Mitsunari in Tenchijin (also sporting a great chonmage). In the run-up to the Battle of Sekigahara in 1600, Mitsunari and Ieyasu jostled for political control of the regency created by Hideyoshi before his death. Sort of a Japanese version of The West Wing circa 1599. Alas, that's not the kind of material to make an American miniseries about. There not being enough time or budget to show the battle itself, we're simply told about the subsequent events. This is unfortunate, considering that Adams himself removed the cannon from his ship, accompanied them to Sekigahara, and commanded the battery. Ieyasu had many reasons to prize the man's company. So in order to place our protagonist in constant peril, Shogun exaggerates the importance of the Jesuits and the Portuguese in the months before Sekigahara. They mostly operated in and around Nagasaki. These confrontations foreshadow the fate of Japan's Christian community and the disastrous war soon to engulf Europe. And Blackthorne's verbal spats with Father Alvito (Damien Thomas, whose Japanese isn't as "native" as his backstory suggests but is nevertheless quite good) make for better drama than the melodramatically overwrought romantic interludes with Mariko (Yoko Shimada). Mariko is far more interesting as a spot-on illustration of the highly syncretic nature of religion in Japan, which can seamlessly blend Buddhist practice and Christian belief without a second thought. In fact, this may be the most accurate reading of Japan's contemporary culture in the miniseries. But speaking of melodramatic excesses, rumors of conspiracies to assassinate Ieyasu really were rife. Though they never materialized, the Machiavellian Ieyasu leveraged them to his own advantage. And so do writers of historical fiction, such as Keiichiro Ryu's Kagemusha Tokugawa Ieyasu.